Arizona Snowbowl has announced it’s earliest opening day ever this morning on Facebook. After days of suspense and delayed openings Arizona Snowbowl has announced that it will open this morning at 10am. Discounted lift tickets will reflect the limited lifts and terrain available. Today is the earliest opening date ever for the Flagstaff ski area. The previous earliest date was November 20th in 2015. 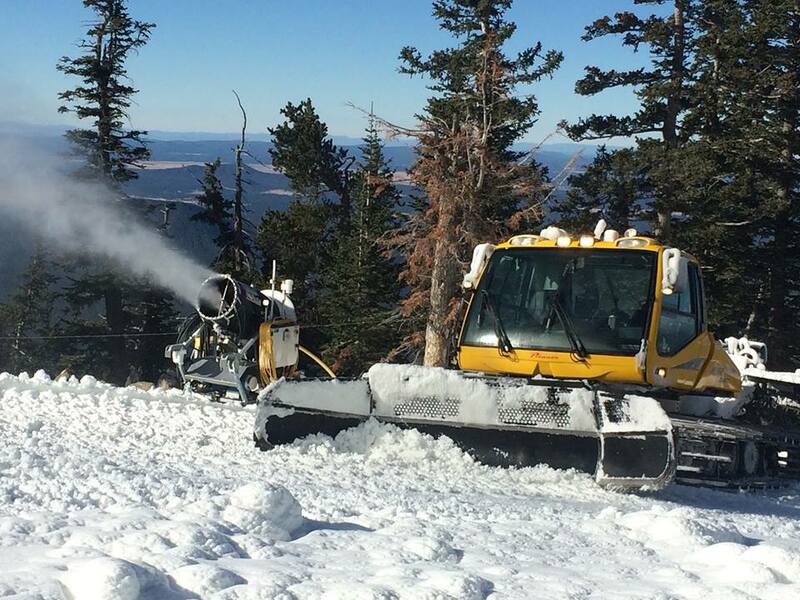 The addition of snowmaking to the San Francisco Peaks resort in 2014 has allowed the area to open in a climate that is anything but predictable. Only trace amounts of snow have fallen so far this season and the ski resort relies heavily on snowmaking. Crews have been fighting warm temperatures at the area but were able to begin snow making efforts in earnest on Wednesday night. TODAY IS OPENING DAY! The Grand Canyon Express and Little Spruce will start turning at 10:00! Lift tickets are $49 and $19, respectively. More details to follow. The following update was made in a press release from Arizona Snowbowl distributed at 2pm, MST, November 19, 2016. Flagstaff, Ariz. — After mountain crews worked around the clock making snow as conditions permitted, Arizona Snowbowl officials announced the ski resort is opening at 10am today, Saturday, Nov. 19 with its new lift, the Grand Canyon Express, high-speed six-person lift. The Grand Canyon Express is Snowbowl’s first high-speed lift and the first high-speed six-person lift in Arizona. Upper intermediate and advanced skiers can ride Snowbowl’s Grand Canyon Express lift and access 1,500 vertical feet and more than a mile of trails on Lower Ridge, Agassiz, and Lower North Star. The Little Spruce conveyor lift provides access to Little Spruce, a beginner trail. Reduced lift tickets are available at the Ticket Window, $49 for the Grand Canyon Express or $19 for Little Spruce conveyor lift. Lifts are open 10am to 4pm Saturday, and 9am to 4pm daily starting Sunday, Nov. 20, 2016. New this winter, Arizona Snowbowl is installing its first high-speed lift and the only high-speed six-person lift in Arizona. The new Grand Canyon Express, named because you can see the Grand Canyon while riding the lift, will transport skiers up the mountain in six minutes. The new high-speed six-pack is just over a mile in length (5,801 feet) with a vertical of 1,546 feet and will provide access to more than 80 percent of the ski area. The top terminal is located on Ridge Trail at 10,900 feet in elevation. The new high-speed Grand Canyon Express will greatly increase uphill capacity and help reduce the lift line on the existing Agassiz triple chairlift. The new lift will provide access to intermediate and expert terrain, and new gladed tree skiing on the north facing slopes under the lift, providing a faster ride time, easier loading and unloading, and allowing for more skiing. Lift capacity is 1,800 persons per hour. The new high-speed six-person lift, which will open this season, is part of a master plan that was developed 14 years ago.